In order to set up email clients like Outlook, Mac mail, or Thunderbird you need your email settings from cPanel. This article guides you through how to locate them. Navigate to your email and click Set Up Mail Client to the right of your email account. Note! If there is no email account listed, you will need to create one. I'm sorry to see that. What is the error you are receiving indicating that it is not working? Hi, I have my domain regsitered with GoDadd and GoDaddy is currently hosting a simple "under construction" website for my domain. I also have an email account for my domain with Office365, which is managed by GoDaddy. I'd like to now transfer my email to IMH and, in a few weeks, point the DNS for my website to the IMH servers once my website is ready to go live. Is that possible? Yes, this is definitely possible. You will just want to make sure that you have all the DNS records you require (for mail and otherwise) set up here at InMotion Hosting before pointing the domain here. I set up a new email address however i'd like the 'from' field to say something different than the first part of the email address. for example the email might be john@mycompany.com. However i don't want the recipient receiving an email from John. i'd like it to say something like 'John from MyCompany'. Where can i adjust these settings? Hope i'm being clear. let me know if you need any more info. You can't choose what appears in an email address when it's sent. This is a standard followed by all email servers. You can create the actual email address, but you can't modify the composition of that address so that it's displayed a certain way. You can create a display name for the email address. So, your "John@example.com" can have a display name of "John from Company ABC". When it's displayed in an email client, the email client will typically show the display name for the email address. Note that different email clients have different options available. However, the structure of a composed email is standard in order to allow proper transmission and tracking. I am attempting to add my email to my iphone. It asks for the Host name. I do not see that listed under your instructions. Any advice? As per this tutorial the "host setting" is typically something like "mail.server.com" . The link provided for the article should go here. 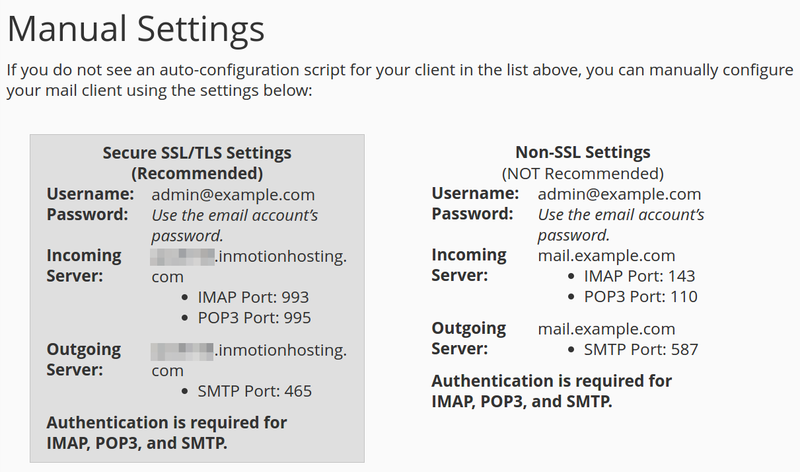 This will provide your email server settings. An example of the secure setting would be: secure111.inmotionhosting.com (secure###.servconfig.com for a reseller account). we are having issues setting up an email account in office365. You will want to proceed first with basic email troubleshooting. For example, checking to make sure you are using the correct incoming server settings.